A battling East Lothian GP surgery has vowed improvements are being made following overwhelming public concern regarding the poor service and serious lack of appointments to see a doctor. 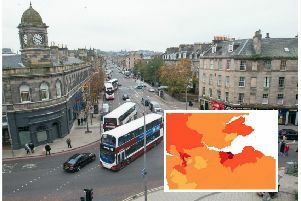 Riverside Medical Practice featured in a list of the 20 worst GP surgeries across Edinburgh and the Lothians as part of the annual NHS Health and Care Experience Survey, which asks people about their experiences with local health care and access. A total of 46 per cent of the patients at the Musselburgh surgery felt they cannot contact their GP in the way they want. The Evening News reported in June last year about how 200 people crammed into the town’s Fisherrow Centre sharing experiences including the sick being hospitalised while waiting up to a month for a GP appointment. Midlothian North and Musselburgh MSP, Colin Beattie, condemned the level of service for his constituents and has met with Health Secretary Jeane Freeman to discuss the future of the second largest practice in the Lothians. Last year, Musselburgh clinics Eskbridge Medical Practice and Riverside Medical Practice merged and introduced Collaborative Working for Immediate Care, which took on a range of specialists to deal with its high volume of patients whose problems could be resolved without seeing their GP. The new service developed in partnership by the Riverside Medical Practice, NHS 24 and the East Lothian Health and Social Care Partnership (ELHSCP) ensured that urgent care is dealt with on the same day and patients should have no anxieties about being seen by the right professional at the right time. Mr Beattie said: “I would like to assure all of my constituents that patient care is of paramount importance and that all agencies involved in the new way services are being delivered within the Musselburgh Primary Care Centre are focused on delivering the best care possible. “Riverside Medical Practice is working to ensure that improvements are made and I would encourage anyone with issues to get in touch with them and become involved with the patient participation group. The practice has indicated that improvements in the way its 19,000 patients are being cared for – including a new telephone and IT system that will support call demand – are being made. A spokesperson from NHS Lothian, said: “We are committed to improving our systems and developing new and more sustainable ways of working to address rising demand while continuing to provide high quality care. We have expanded our team of multi-discipline health professionals so that patients receive quicker more direct access to the appropriate care.